Finals week can be a stressful time for students (and parents) so I thought I would bring them a little joy, happiness, and goodies, I call it the Final Exam Emergency Kit. I talked with parents after church on Sunday and asked what their kids favorite snack was. I took notes on my IPad and and a made a visit to the dollar store. Each bag cost around $5 to make. Here is the video and what I experienced after one visit. 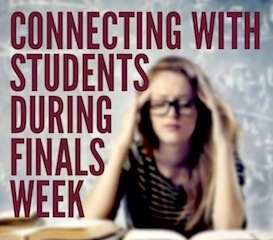 Do you anything like this around finals week? Leave your idea below.